On Saturday, June 10, “SING!” (PG), will grace the screen at Newtown Park. The film is set in a world like our own but entirely inhabited by animals. Sing stars Buster Moon (Matthew McConaughey), as a dapper Koala who presides over a once-grand theater that has fallen on hard times. Buster is an eternal optimist who loves his theater above all and will do anything to preserve it. To save his theater, he decides to produce the world’s greatest singing competition. But the competition becomes grander than he anticipates even as its finalists’ find that their lives will never be the same. 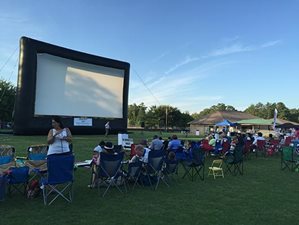 Movies at Newtown Park are free and include pre-show entertainment such as an inflatable moonwalk, face-painting, children’s activities, give-aways, music, food and drinks. Pre-show activities begin at 7 p.m. Movie begins after sunset. Foodtrucks are scheduled for each of the Movies at Newtown Park events! The Saturday, June 10 movie will feature the Patty Wagon food truck. For more information on future movies at Newtown Park, please the City website.